OS Terrain 50. A new product, which has a similar resolution to Land-Form PANORAMA, will enable users to access an advanced product with consistently maintained height content for the whole of Great Britain. OS Terrain 50 TM is a height product for Great Britain which enables you to add the third dimension to your regional scale applications. It is maintained alongside our other products to maximise interoperability between our data products. It benefits from comparatively lower data volumes for ease of use and data storage whilst enabling a realistic view of the landscape for risk assessment, development and environmental analysis. 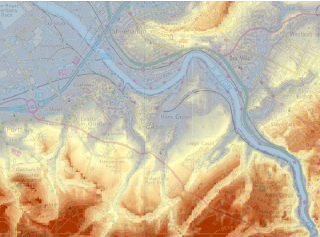 OS Terrain 50 is shown overlaid by 1:50 000 Scale Colour Raster.